Chain Reaction (aka Critical Mass, aka Atoms) is an addictive, multi-player 'board' game. It's easy to learn to play. There is a computer player (for 2 player games only). Players take turns to add units (blobs) of their colour to either an empty cell or a cell they already occupy. Once the number of blobs in a cell equals the number of neighbouring cells - 2 in a corner, 3 along an edge and 4 elsewhere - the blobs 'explode', adding 1 blob to each neighbour and leaving the original cell empty. The neigbouring cell may then have enough blobs to explode as well - making their neigbours explode, and so on - a chain reaction. 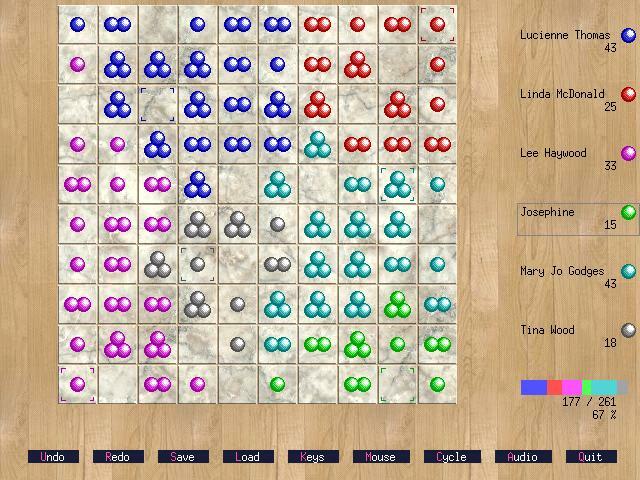 Any blobs affected by the chain reaction change colour to that of the person making the move - this is how other player's cells are taken. 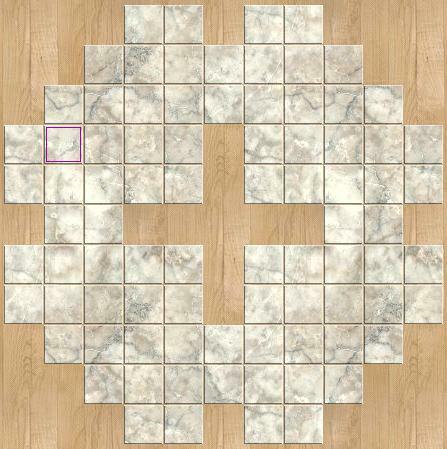 Wipe out your opponent(s) and win - eventually someone is going to win because the total number of blobs increases by 1 with each move, gradually filling the board. Here are some pictures showing the basic principles, an opening move (attack) and an explanation of 'traps'. Provides a high-quality computer player (for a single opponent). Allows between 2 and 6 players. Graphical implementation - can be played either in a window or in full-screen mode. Configurable for different screen resolutions, allowing massive boards to be used. Audio support for both sound-cards and simple beeps/bells. Automatically moves the mouse pointer back to the current player's last position. Indicates where each player last went. Shows progress indicators for each player and for the whole game. Player names may be entered and saved. Players can choose their favourite colour to play with. Foreground and background 'skins' may be changed. Saved states can be automatically loaded when the program starts. Provides the ability to undo and redo all moves. Games in progress can be saved and resumed later. Locks keyboard and mouse controls individually for each player. Players can stick with their favourite colour when the order of play is changed. Sound can be turned on and off during a game (for both samples and beeps). This game was originally shown to me on the Atari ST by Stephen Broumley when we were studying Computer Science at The University of Sheffield (1990-1993). Stephen drew the original blobs for me and I've since added more shading to them. I managed to track down a copy of the ST version and play it on the WinSTon emulator, (although Steem might be more accessible). It was written by Stephen Taylor and Colin Whitehead and released as shareware, based on a previous game called "Atoms". I wrote my MS-DOS version (reaction.exe, 79 K) from scratch in Stony Brook Modula-2, but no longer have the source (it was on one of my many hundreds of floppies, now lost forever). I have now rewritten it to be better than ever before. In April 2003, Chain Reaction appeared in issue 29 of Linux Magazine (PDF, 323 K). The article is now out-of-date. Brian Damgaard provided the computer player in August 2003 and it was fully integrated by November 2003. This is the Linux (X Windows) and MS Windows ('95, '98, NT, 2000, XP) version. Both programs are based on the Simple DirectMedia Layer library (SDL). Last updated: 2 July 2006, 10:58 BST. reaction-3.01.src.tgz (408 K) (Linux) version 3.01 source code and data files (requires SDL source). reaction-3.01.i386.tgz (456 K) Linux version 3.01 and data files (requires SDL). reaction-3.01.zip (462 K) MS Windows version 3.01 and data files (includes SDL.dll). Note: Sound does not work properly with MS Windows 2000, XP and (presumably) Server 2003 – though you can still enable it. with your praise, comments, ideas, stories, etc. These pages have been validated. © 2001–2011 by Lee J Haywood.